I love discovering new cookbooks and my most favorite recent discovery is The Back In the Day Bakery Cookbook by Cheryl and Griffin Day. Their bakery in Savannah looks like one of the coolest bakeries around. My Savannah has been asking to go to the city she is named after for years and I am considering planning a road trip there just to visit their bakery. I want to make just about everything in this little book from the Guava Sweet Cheese Turnovers to the Pancetta Fontina Bread Pudding. 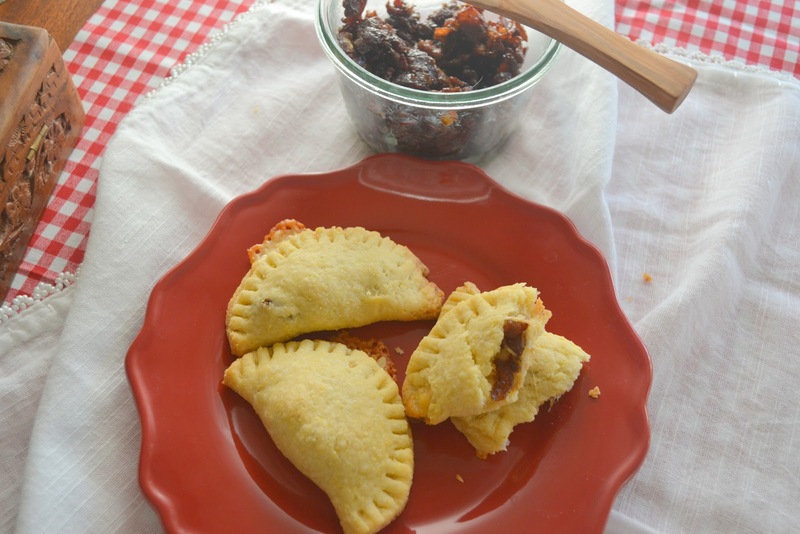 But when saw the Bacon Jam Empanadas I was smitten and knew this would be the first recipe for me. Bacon jam? Seriously? Where has this been all my life? Now that I've had bacon jam, I don't think I can be without it. It is one of those foods that defies definition but I'm going to try. I'm trying to come up with something to compare it to and can't think of anything else like it. It's sticky and crunchy. Sweet and salty. Delicious. And easy to make. Simply fry up a pound of bacon. Save a bit of the rendered fat to quickly caramelize some onions and then pour in brown sugar, coffee, maple syrup, balsamic vinegar, garlic, some dried rosemary, Coca-Cola (a splash of Bourbon is added later). Cook until jammy. Now I am perfectly content to just eat this straight from the jar but it was also delicious as an empanada. The cornmeal crust has such a lovely, rustic texture. I am looking forward to using it with fruit pies. I didn't process my bacon jam in a food processor in order to maintain its texture but I think it would be best to do so for the empanadas. The recipe indicates that you will have leftover bacon jam. This is a very good thing. I plan on using this as a spread on sandwiches and think it would be especially tasty on a BLT. Bacon on bacon anyone? Cooks Notes: The recipe below is the original but I did make a few minor changes. For the jam: diced the onion, used cayenne pepper instead of red pepper flakes, and substituted water for the coffee. I got about 10 circles out of the dough and wished I had rolled it slightly thinner. I completely forgot about using the egg wash.
To make the bacon jam: Roughly chop the bacon into 1-inch pieces. Render the bacon in a large skillet over medium heat until the edges start to turn brown but the bacon is still soft. Drain the rendered bacon fat by setting a fine-mesh sieve over a bowl and spooning the bacon and rendered fat into the sieve. Let the bacon sit in the sieve while you caramelize the onions. Add the sliced onions to the skillet, then add 1 tablespoon of the rendered bacon fat and cook over medium heat, stirring frequently, until the onions are translucent and starting to brown, 10 to 12 minutes. Add the garlic, rosemary, red pepper flakes, brown sugar, coffee, Coke, balsamic vinegar, and maple syrup, stir, and bring to a light boil. Add the drained bacon and bring back to a light boil, then turn the heat down to medium-low. You want to keep a low, steady simmer to reduce the liquid and thicken it without burning the jam. The process of reduction can take as long as 1 hour. If the jam becomes too dry, add 1 to 2 tablespoons water. Remove the bacon jam from the heat, add the bourbon, and let cool for 20 minutes. Depending on your preference, you can use it as is or process the jam in a food processor to a less chunky consistency. Once it has cooled, you can put the jam in an airtight container and store it for up to 1 week in the refrigerator. To make the empanadas: Position a rack in the middle of the oven and preheat the oven to 350 degrees F. Line a baking sheet with parchment. Remove the cornmeal crust from the refrigerator and let it sit on the counter for 15 minutes. Lightly flour a smooth work surface. use a rolling pin to roll the dough out 1/8 inch thick. Using a 4-inch biscuit cutter or tart mold, cut the dough into 7 circles. Place 1 tablespoon bacon jam and about 2 tablespoons shredded cheddar cheese in the center of each round. (You will have extra bacon jam.) Fold each dough round in half over the filling, making sure you don't tear the dough or push the filling to the edges, and using your fingers, press the edges together and then crimp them with the tines of a fork to seal them. Place the empanadas on the prepared baking sheet and bake for 10 minutes. Remove the empanadas from the oven and brush them with the egg wash, then bake for an additional 8 to 10 minutes, until golden brown. Serve the empanadas warm. In a medium bowl, whisk together the flour, cornmeal, sugar, and salt. Using a pastry cutter, cut in the butter until the mixture resembles coarse oatmeal. Add 1/4 cup ice water, stirring lightly with a fork until the four is moistened, then gently knead the dough 4 to 6 times in the bowl, until it comes together. You may have to add up to an additional 2 tablespoons water if the dough seems dry. Shape the dough into a ball and flatten it into a thick disk. Wrap it in plastic and refrigerate for at least 1 hour or up to 1 day.